I joke about being Mrs. Rampal in the next life, but I really do admire the current Mrs. Rampal. 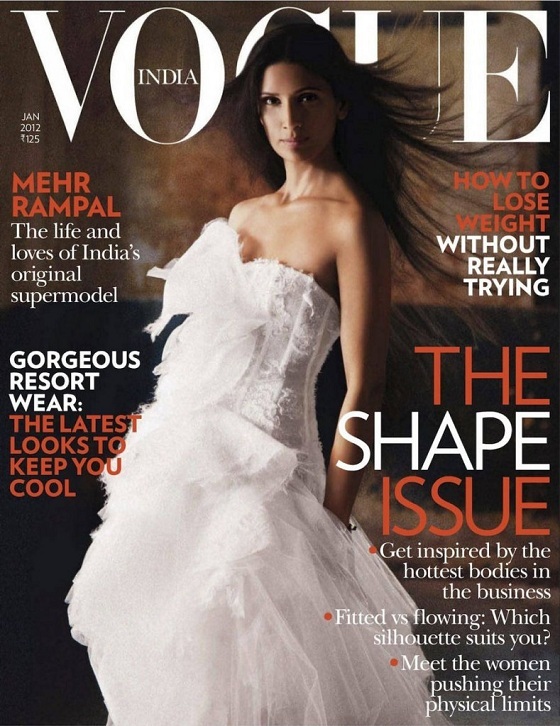 A former supermodel, she revived her role in this month’s Vogue India. She sizzles on the pages of the mag’s annual shape issue. Mr. Rampal, you are a lucky man. I loved the rock-star vibe in the photos, styled by Vogue India Fashion Director Anaita Shroff Adajania (one of the best in the biz, in my opinion) and shot by Prabuddha Dasgupta, who helped make Laxmi Menon a household name. Love the movement in the cover photo. You know I'm going to need those heels, right? Arjun seems to be a gam-bling man. I know I am not a frou-frou girl, but this textured thing that's going on right now, seems to be calling to me. Maybe it's the soft goth vibe? This crazy, glittery Dolce dress also has my attention, this season. I have a vintage version of it with shorter sleeves, in gleaming gold. I know. She looks fan-freaking-tastic with longer hair, no?